Aero Asahi Corporation (AAC) is the largest helicopter operator in Japan. Although they mainly provide aviation services such as helicopters and business jets, they also specialize in spatial information services with access to some of the most advanced surveying technology in Japan. AAC partnered with SkymatiX, Inc., and together they provide 3D data generation services. They named this service as Kumiki. Kumiki instantly transfers photographic data taken by drones into the cloud. Kumiki also generates orthoimages with 3D specifications (such as elevation differences) in a short time frame, and at a significantly lower price. The cost of this kind of service can start from 9000 USD, with Kumiki however, the price for such services are reduced to approximately 25 USD per month. Classmethod was hired to assist on the API design, as well as designing an architecture that automatically processes the data. Kumiki is made up of a combination of cloud-native technologies. It uses Amazon API Gateway and AWS Lambda for its front-end interface, and AWS Batch for its back-end processing. With AWS Lambda, the cost of infrastructure maintenance and AWS usage was reduced. This is because the automatic processing of data generation is done on demand, therefore making cost reduction of both execution and processing possible. 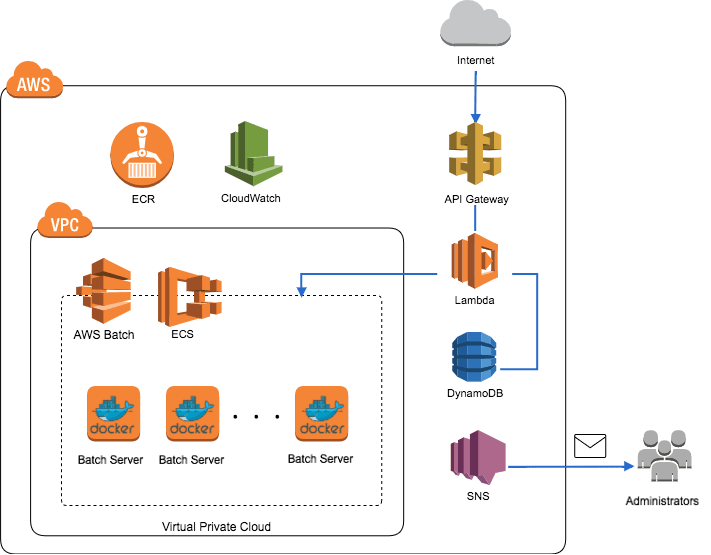 It’s worth noting that AWS Batch made it possible for Kumiki to be an economical operation while also maintaining scalability for high load processing. With this advanced system adaptation of a serverless architecture, Kumiki provides the ideal low cost and high-quality service.